Sales in the industry’s main powerboat segments reversed course. 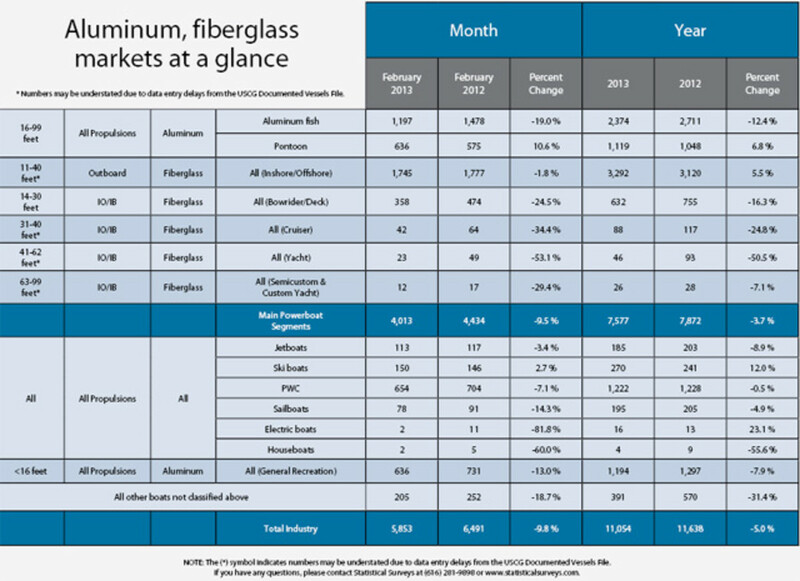 Rather than the double-digit gain of a year earlier, the group that consists of two aluminum and five fiberglass categories saw a 9.5 percent decline in sales, to 4,013 boats in February, from 4,434 in the same month a year earlier, Statistical Surveys Inc. said. Industrywide, sales dropped 9.8 percent, to 5,853, from 6,491 a year earlier. Ryan Kloppe, Statistical Surveys’ national marine sales manager, said the 2013 results suffered by comparison with the sharp sales gains the industry had in 2012. A year ago, when reports from all 50 states were in, main-segments sales rose 34 percent in February, to 5,662, from 4,228 in February 2011. Industrywide sales climbed 28 percent, to 10,119, from 7,814 in the previous February, Kloppe said. Among the main segments, the only category that showed a gain in February this year was aluminum pontoon boats, where sales rose 10.6 percent, to 636. Categories that declined did so in double digits, except for 11- to 40-foot outboard fiberglass boats, where sales were off by a slight 1.8 percent, or 32, to 1,745. Aluminum pontoons and fiberglass outboards have been strong sellers for the past year as the industry continues to rebound from the effects of the Great Recession. Sales of aluminum fishing boats fell 19 percent in February, to 1,197, sales of 14-to 30-foot inboard and sterndrive boats dropped 24.5 percent, to 358, and sales of 41- to 62-foot yachts dipped 53.1 percent, or 26 boats, to 23. Sales rose industrywide in January, mitigating the effects of the February slump. For the first two months of the year, main-segment sales are off 3.7 percent, at 7,577 boats, and industrywide sales are off 5 percent, at 11,054.